In order to celebrate the official registration of our Ludoscience association, we organized a party at "La Cantine" in Toulouse (France). We proposed a selection of Serious Games to play, but we also introduced a wide selection of great french wines to taste and drink. 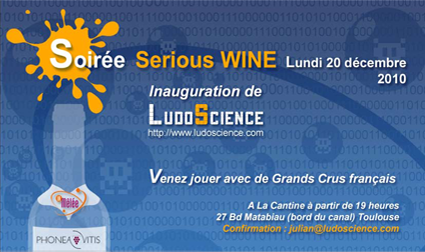 "Inauguration de LudoScience : quand Serious game rime avec Serious Wine?"